Constable Rajender Gautam, 36, a resident of Bilaspur in Himachal Pradesh, died around 5.30 am at the Safdarjung Hospital, NDRF Inspector General L Ravi Joseph told PTI. A constable of the National Disaster Response Force who sustained a severe spinal injury while saving a pilgrim from drowning in the Kumbh Mela died in a Delhi hospital on Friday, a senior NDRF official said. On February 19, he jumped into the waters of the Sangam, a confluence of the Ganga Yamuna and the mythical Saraswati, to rescue an elderly man. “Gautam was on duty at the Kumbh Mela on February 19 when he saw an old pilgrim struggling in the water. He had crossed the safety barrier to take a holy dip in the river waters near Someshawara Ghat. Gautam was on an NDRF boat and jumped into the river without caring for his own life,” IG Joseph said. Though the pilgrim was saved, Mr Gautam was left with a severe injury in the spine. “He was first rushed to a local hospital and from there referred to the Swaroop Rani Hospital in Allahabad,” IG Joseph said. “Considering the severity of his condition, he was moved to Delhi”s Safdarjung Hospital in an Uttar Pradesh government air ambulance on February 19 itself,” he added. The following day, Rajendar Gautam underwent a surgery and was in “recovery mode”. However, his condition started to deteriorate in the early hours of Friday and doctors couldn’t save him despite their best efforts, the IG said. “We are awaiting the arrival of his wife from Himachal Pradesh. After that, his mortal remains will be taken to his native place for the last rites,” IG Joseph said. NDRF Director General S N Pradhan and several senior officials of the rescue force gathered at the New Delhi Municipal Council’s Convention Centre in New Delhi to pay their last respects to the constable. “Constable Rajender Gautam laid down his life in selfless service to the nation and to humanity as a whole. The courage and dedication shown by him has been exemplary and he indeed lived up to the motto of the NDRF — ‘Saving Lives and Beyond’,” IG Joseph said while paying tribute. Many civilians and several scouts and guides, who had come to attend a function on World Scout Day, also joined in in mourning his untimely death. NDRF personnel paid tribute to their colleague by blowing the ceremonial bugle and lowering their guns. Rajendar Gautam belonged to the NDRF’s 9th Battalion stationed in Patna. 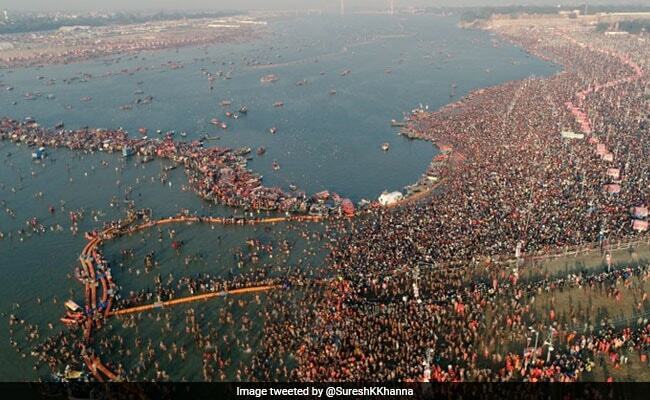 This entry was posted in Kumbh and tagged NDRF, Rajendra Gautam, Uttar Pradesh Government.